A complete ICT course for children from five years of age. Cambridge ICT Starters: On Track, Stage 1 has been designed to support learners who are following the Cambridge Information and Communication Technology Starters syllabus. This book provides full coverage of all the modules. The sections of the book follow the order in which the modules appear in the syllabus. It builds on creating and formatting documents; planning, creating and organising multimedia presentations, incorporating audio and animation effects; designing and creating, testing, modifying and evaluating spreadsheets and graphs; creating, developing and testing databases; and maintaining data security. 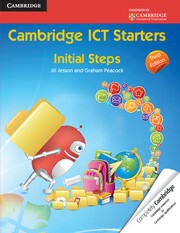 The activities in the book use Microsoft Office ® 2007 and Windows ® 7. Optional extension and challenge activities.